We’d love your help. Let us know what’s wrong with this preview of The Opposite of Fate by Amy Tan. To ask other readers questions about The Opposite of Fate, please sign up. Reading this book is like sitting down to lunch with someone you hardly know and making a new friend. I happen to love Amy Tan's novels. I also like to read about writers and how they got their breaks. This memior/musings/essay book held a lot of the magic that is found in Joy Luck Club/Kitchen God's Wife with a lot of reality and the daily suffering of a writer. I particularly enjoyed reading about Tan's mother (but of course it's the crazy/hard-lifed mothers that make Joy Luck and Kitchen God's Reading this book is like sitting down to lunch with someone you hardly know and making a new friend. I happen to love Amy Tan's novels. I also like to read about writers and how they got their breaks. This memior/musings/essay book held a lot of the magic that is found in Joy Luck Club/Kitchen God's Wife with a lot of reality and the daily suffering of a writer. I particularly enjoyed reading about Tan's mother (but of course it's the crazy/hard-lifed mothers that make Joy Luck and Kitchen God's Wife so good) and about her path to making it as a writer. I also liked reading about how her mother made her sit down at the piano and practice for an hour every day even when she'd much rather be outside playing. I even liked reading about her thoughts on lanuage and how they formed who she is today, as a writer and generally as a person. Amy Tan is one of the finest American writers we have. I am making it a point not to call her one of our finest women writers or Chinese-American writers or a writer of color, an issue which is explored in this memoir. This book may be a special taste -- you might need to be someone who loves her work and is interested in writing to fully appreciate it. Amy tells her stories with certainty and elegance and never overstates anything. I listened to this book which was all the better for having the Amy Tan is one of the finest American writers we have. I am making it a point not to call her one of our finest women writers or Chinese-American writers or a writer of color, an issue which is explored in this memoir. This book may be a special taste -- you might need to be someone who loves her work and is interested in writing to fully appreciate it. Amy tells her stories with certainty and elegance and never overstates anything. I listened to this book which was all the better for having the author as the narrator as she imbues her prose with subtle inflections, careful pauses, rises and falls of volume. One particular instance comes to mind when she very carefully uses the word "racist". She also changes her voice when she reads words that came from her mother, an effect both humorous and touching. It was fascinating to learn what the true stories are that inspired her fiction as well as her surprisingly pleasant experience in Hollywood while making the film version of the Joy Luck Club. I really enjoyed this book. It was so different from the books I normally read. Amy Tan has led an interesting life! It was a little slow 3/4 of the way through, but I enjoyed reading about her life and relationship with her mother. Seeking the "American Dream" and the chinese culture of honoring and obeying your parents are so polar opposite. It's understandable that first generation kids grow up very confused. I highly recommend this book to all writers as well as those interested in the “evolution” of a writer. I truly enjoyed Amy Tan’s honest and insightful account of her “journey,” told through a series of essays and autobiographical sketches. I especially appreciated Tan’s essay, “Required Reading and Other Dangerous Subjects,” in which she rejects the widespread belief that writers come in colors – and those colors do not mix and match. It is a biting critique of those who would dictate who is qu I highly recommend this book to all writers as well as those interested in the “evolution” of a writer. I truly enjoyed Amy Tan’s honest and insightful account of her “journey,” told through a series of essays and autobiographical sketches. I especially appreciated Tan’s essay, “Required Reading and Other Dangerous Subjects,” in which she rejects the widespread belief that writers come in colors – and those colors do not mix and match. It is a biting critique of those who would dictate who is qualified to write about various cultures and peoples and how they should do so. Bravo Ms. Tam for refusing to play the label game. Despite the subtitle, I bought this book expecting it to be more of a memoir than it actually is. I think Amy Tan's main purpose in writing it was to set the record straight on a variety of topics, beginning with an inaccurate summary of her life that turned up in an edition of CliffsNotes. She does so in essays that directly address the points that need to be made, and also tosses in other writings that range from a college commencement address to an item she wrote for the newspaper when eight Despite the subtitle, I bought this book expecting it to be more of a memoir than it actually is. I think Amy Tan's main purpose in writing it was to set the record straight on a variety of topics, beginning with an inaccurate summary of her life that turned up in an edition of CliffsNotes. She does so in essays that directly address the points that need to be made, and also tosses in other writings that range from a college commencement address to an item she wrote for the newspaper when eight years old. As such, it's somewhat disjointed and uneven. Some parts appealed to me much more than others. Early on, she provides some personal and family history, which includes plenty of elements readers will recognize from her fiction (a character who goes one day each year without speaking, for example, and most certainly the memorable voice of her mother). This is followed by a section in which she argues that readers ought not assume that her stories are autobiographical. (Maybe they aren't, but reading between the lines in yet another section one can conclude that she sees a self-portrait in The Kitchen God's Wife.) There's also an eloquent rebuttal to the people in publishing and educational circles who insist on pidgeon-holing her as a representative of her ethnic group, gender, color, etc. and looking to her for politically correct lessons. That kind of writing, she feels (and I agree) amounts to propaganda, not literature. She says, "I write stories about life as I have misunderstood it. To be sure, it's a Chinese-American life, but that's the only one I've had so far." There are points at which it seems the lady protests too much. She mentions a journalist friend who says, "Any attention is valuable ... If you receive any, you should be grateful." I rather agree with that as well, because Tan's path to literary success appears to have been unusually smooth. Better to be misunderstood by some harebrained people than completely ignored. This is not to suggest that she doesn't deserve success; she emphatically does. But she too acknowledges that she has been lucky. Her luck has not been only literary, since apparently she's had more than her share of close brushes with death. For me, the final section is devastating. It describes a mysterious illness that overtook her and the frustratingly slow process of getting a diagnosis. Because of the story described in my own book, I recognized her discovery that most doctors and even professional medical societies are clueless when presented with something out of the ordinary. I recognized the cynical but helpful voices she found on Internet discussion boards, and her conclusion that, rare or not, this thing afflicts a heck of a lot of other people. I just read it because my mother recommended it to me. This book is clearly written for the author's fans. Since I had no idea who she was, I found it quite self exalting. The author describes her life and the events that inspired her novels, which were inspired by her mother and grandmother's struggles in China. A recurring topic throughout the book is the minority issues of being a chinese american and how she has been influenced by both cultures. Another important aspect of the book has to do w I just read it because my mother recommended it to me. This book is clearly written for the author's fans. Since I had no idea who she was, I found it quite self exalting. A recurring topic throughout the book is the minority issues of being a chinese american and how she has been influenced by both cultures. Another important aspect of the book has to do with spirits and life after death. Frankly, most of the book was quite boring and uninteresting for me. 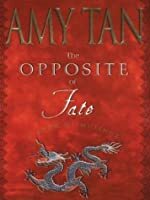 The Opposite of Fate by Amy Tan has long been one of my favorite books, so it's about time I reviewed it. This "memoir" is a collection of essays, speeches, and articles written over the course of many years, categorized into themed sections. Collectively they explore Tan's Chinese heritage, her childhood as the daughter of immigrants, and her journey to becoming a well-known author of American fiction (Tan prefers not to be categorized as a Chinese-American or Asian-American author, which she discusses in the essay "Required Reading and Other Dangerous Subjects." I like her reasons.). I think that is why I love this book so much; it is a candid, well-written, and insightful look at life from many perspectives. It inspires empathy and thoughtfulness when relating to other people. I do not necessarily "agree" with all of the views/beliefs in this book, but I think the best books help you step outside of yourself and see things through another's eyes. I have read all of Tan's books, usually within days of release, and this was a great way to "get to know her better". You can guess at a lot of her personal life just by reading her books, with the exception of Saving Fish from Drowning: A Novel, but it was still interesting to see just what was real and what was fiction. There was a lot of repetetiveness, but that was to be expected. It says right on the description that these are mostly personal essays and speeches written over a period of year I have read all of Tan's books, usually within days of release, and this was a great way to "get to know her better". You can guess at a lot of her personal life just by reading her books, with the exception of Saving Fish from Drowning: A Novel, but it was still interesting to see just what was real and what was fiction. There was a lot of repetetiveness, but that was to be expected. It says right on the description that these are mostly personal essays and speeches written over a period of years. Things that are very important to you personally will keep coming up. Especially since those essays and speeches were originally meant as stand alones. It didn't bother me at all. Again, it just made it more clear which events had the biggest impact on Tan as a person, and in some cases, a writer. As much as I enjoyed each entry, with the exception of Required Reading and Other Dangerous Subjects which I found a little too "instructive", my favorite parts were her stories about the band she belongs to, The Rock Bottom Remainders. Stephen King is a member of that band and my favorite writer, so all the little things she said about him and his wife Tabby were like bonuses for me. I was thrilled to find those references where I had not expected them. I have read a few of Amy Tan books, and I enjoy them immensely. I found this biography book by her, funny at times and enjoyable to read. Interesting to learn a bit how she comes up with the novels that she writes. And I certainly hope that she continues. Good book – she writes a self-deprecating memoir. Her family history was very interesting. This collection of essays is solid and intriguing. I really enjoyed this book on how she got started writing and what inspired her. It was entertaining as well as enlightening to read. This book was a pleasure to read. I don't know whether it could technically be called a memoir; it's basically a collection of mostly autobiographical essays and musings. Whatever its classification, these essays were well-written (no surprise there), interesting, provocative, and often funny. Amy Tan had just the right degree of self-deprecating humor so that she came across as refreshingly humble but not neurotic -- someone I would probably enjoy being friends with, as opposed to many other au This book was a pleasure to read. I don't know whether it could technically be called a memoir; it's basically a collection of mostly autobiographical essays and musings. Whatever its classification, these essays were well-written (no surprise there), interesting, provocative, and often funny. Amy Tan had just the right degree of self-deprecating humor so that she came across as refreshingly humble but not neurotic -- someone I would probably enjoy being friends with, as opposed to many other authors whose works I've enjoyed but with whom I'd probably not want to socialize (e.g., Dorothy Parker, Vladimir Nabokov, J. D. Salinger). I also liked the way she depicted her mother honestly in all her eccentric difficulty (undiagnosed borderline personality disorder, I strongly suspect), yet managed to show the affection she felt for her and the full range of their complex relationship. As hard as it must have been for her to grow up with a mother like that, Amy Tan didn't trash her, nor did she idealize her or misrepresent her behavior or their relationship. The tone of genuine affection and respect for her mother was maintained throughout, even as she described some clearly difficult encounters. What had started as subterfuge on my part grew into an epiphany. I began to so see how much I actually knew about my mother and myself. She was losing her mind, yes, but I was losing defenses built up and fortified from childhood. . . . It had been so simple to make my mother happy. All I had to do was say I appreciated her as my mother. Several years ago, when I read Joy Luck Club, I began to understand my own mother a little bit better and discovered how long-held secrets and suppressed memories shaped her and affected our relationships with her. So this book of Amy Tan's own memories even further illuminates what I already felt with her first novel -- I'm not alone in how I grew up. Amy speaks of her maternal grandmother, who died when her mother was just nine years old, as an ever-present ghost who serves as a muse of sorts. And I totally get it. I do believe that a strength of personality can survive death and distance and become a motivating force in one's life. After reading her memoir and finding out that so much in her books was based on her life, I empathized with Tan even more. I especially loved the stories about her mother's dementia, as it shows the true connection between mother and daughter. The answer to "When will you be home?" is not a specific time and date, but "We're almost home, because we love you so so much and can't wait to see you." Parts of the memoir were funny, parts were truly sad, but I also empathized with Tan's childhood (alt After reading her memoir and finding out that so much in her books was based on her life, I empathized with Tan even more. I especially loved the stories about her mother's dementia, as it shows the true connection between mother and daughter. The answer to "When will you be home?" is not a specific time and date, but "We're almost home, because we love you so so much and can't wait to see you." Parts of the memoir were funny, parts were truly sad, but I also empathized with Tan's childhood (although maybe not the Swiss boyfriend and travelling across Europe). I love the story where Tan was 14 and crushing on the minister's son, whose family her dad invited over to dinner. Not only did Tan's mother serve the most Asian, weird-looking foods, but her family also belched loudly and said that this was the Chinese custom to show that you are satisfied. Only later did Tan learn the moral behind the dinner: her mother had prepared all her favorite foods. Amy Tan was a dreamer, just like me. When she was in middle/high school, she would always be the one standing awkwardly on the sidelines who never got asked to dance, dreaming of being called on stage by the lead singer and being a STAR. Being chosen, and not neglected. Glamorous and not ungainly. Exotic. And then in 1993, when she joined a rockand roll band with some other authors like Barbara Kingsolver and Stephen King, she got to be a real rockstar. And later, I discovered that maybe it was fate all along, that faith was just an illusion that somehow you're in control. I found out the most *I* could have was hope, and with that I was not denying any possibility, good or bad. I was just saying, if there is a choice, dear God or whatever you are, here's where the odds should be placed." Buku ini lebih pas dibaca oleh orang yang sudah pernah membaca karya-karya Amy Tan. Aku sudah membaca 3 buku Amy, and love all of it. Karena buku ini adalah karya nonfiksi pertama Amy tentang perjalanan hidup yang membentuk dirinya sebagai manusia dan sebagai penulis. Bagaimana ia melepaskan diri dari masa lalu dan menggapai takdirnya sendiri. Buku yang ditulis Amy terinspirasi dari kehidupan Amy dan keluarganya, terutama ibu dan neneknya. Membaca buku ini, seolah-olah mendengarkan Amy bercerita Buku ini lebih pas dibaca oleh orang yang sudah pernah membaca karya-karya Amy Tan. Aku sudah membaca 3 buku Amy, and love all of it. Karena buku ini adalah karya nonfiksi pertama Amy tentang perjalanan hidup yang membentuk dirinya sebagai manusia dan sebagai penulis. Bagaimana ia melepaskan diri dari masa lalu dan menggapai takdirnya sendiri. Buku yang ditulis Amy terinspirasi dari kehidupan Amy dan keluarganya, terutama ibu dan neneknya. Membaca buku ini, seolah-olah mendengarkan Amy bercerita tentang dirinya seperti layaknya seorang teman. Buku ini semacam memoir, tapi dengan bahasa yang mengalir, tidak dilebih-lebihkan atau diindah-indahkan, layaknya percakapan yang mengasyikkan. 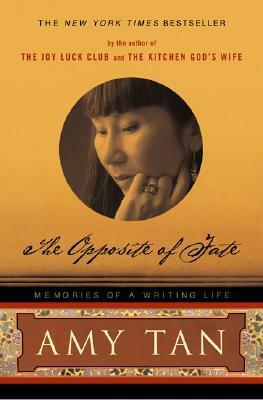 Thoroughly enjoyed this interesting collection collection of memories from Amy Tan's life. I enjoyed what Ms. Tan shared and she is someone I probably would enjoy meeting. Because of the book, I'd go out of my way to hear her speak. Rating and writing a review of a living person's memoir is difficult because it is too easy to make the leap into rating a life and that's certainly not the original purpose of Goodreads. I read the Joy Luck Club many years ago and absolutely loved it, but have never read anything else from her. I wasn't expecting too much out of a non-fiction book, but for a autobiography/essay/speech/random writings I felt that this book read like a novel. I loved seeing how her real life was intertwined into her novels, making memories into literature. We've had this book for years and I only just got to it before 2016 ended. It was sitting on the shelf with me thinking "I read enough Amy Tan, they're all similar books". Glad I finally read it. This one was definitely different. Maybe it's a good time to reread her books and see how I feel about them now. Read by Amy Tan herself, this cd has been thoroughly entertaining. Listening to Ms. Tan read the voice of her mother was worse the price of admission in itself. Many different themes in her life are discussed, including mother/daughter relationships, the writing life, crime, fans, health, and so on. Fantastic! I think I may have found a new favourite author to influence my reading choices over the next few months. Refreshingly honest and beautifully written. I feel like I've been listening to the reminiscing of an old friend. One of the most stunning memoirs I've ever read. The pieces aren't written as though intended to be a cohesive book, but true to her own form, Amy Tan weaves each selection to let you see the life behind her stories. Funny and insightful and full of charm. Loved it.